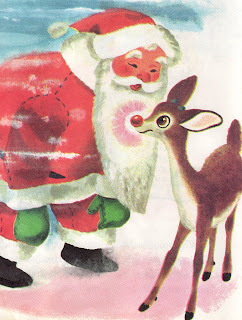 The other reindeer in the book play an old (imaginary?) game called tumble bones... one of the games Rudolph isn't allowed to join in on. Happily my son has made up his own version of the game that includes falling (ahem, tumbling) on the ground and rolling around. Hilarious. All the reindeer loved to play games. They played tree tag and snow slide and tumble bones. But Rudolph was never asked to play. He stood behind a pine tree and watched. After about a thousand reads over the Thanksgiving holiday, I can now recite this book by heart, even though it barely resembles the song. My son talks about Toyland (you know, where Rudolph lives?) like it is down the street from our house and is totally jazzed about the whole idea of a deer with a nose that glows. I can't say that I blame him. I had a copy of this book way back when, since as we know, Scarry was THE illustrator of my generation. I just can't say enough about how cool and sweet his pictures are. And, I have to say that the holiday books of today blow... If I have to look at another Dora story/sticker Feliz Navidad paperback, I'm gonna scream. I mean, since when did all children's books have to come with stickers? My sister and I grew up in the Texas Hill Country. We played Tumble Bones, and it was great fun. We'd lay down at the top of a hill, cross our feet and tuck our arms by our sides, then roll down the hill in a race to the bottom. Of course whether you won or lost you'd be too dizzy to stand up and claim victory, so the game always ended with lots of giggles.